When I decided to volunteer with Winrock International’s Farmer-to-Farmer program, I wasn’t sure what I was getting myself into, and while I was assured by a fellow volunteer that I would be taken care of, I never anticipated how great this opportunity could be. 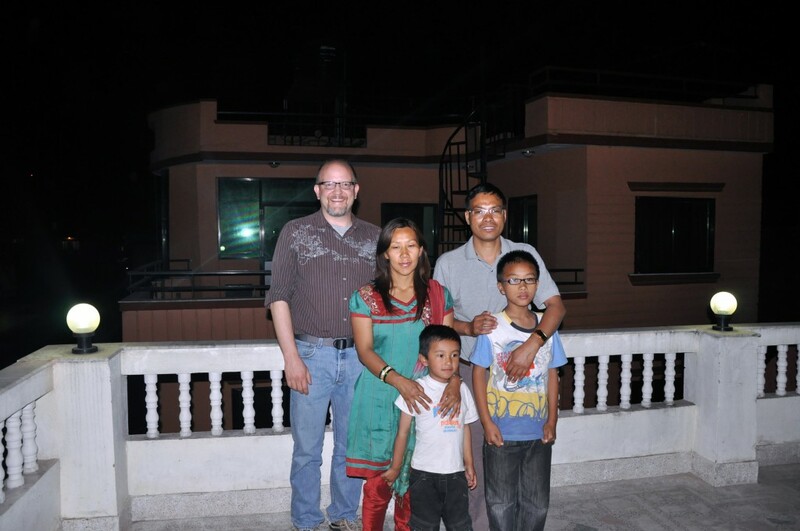 Upon arrival and throughout my time in Nepal, Winrock’s small (maybe 5 people) but dedicated team made me feel right at home, making it easier to focus on my task at hand – increasing the data handling and analysis capacity of young, experienced, faculties and selected post-graduate students through the application of R.
Chhan and family invited me to have dinner at their home while in Kathmandu. It was, hands down, the best meal I ate while in Nepal. My primary contacts in Nepal were Dr. Vrigu Duwadi and Mr. Chhan Bhattachan with Winrock, and Dr. Mohan Sharma, Professor and Continuing Education Center Director with the Agriculture and Forestry University of Nepal. I can’t say enough good things about these individuals. All of my activities while on assignment were coordinated through this team (with the invaluable inclusion of Krishna, our driver) to assure that we were delivering information that was pertinent to the audience and that facilities and logistics essential to the success of the training were available. In addition, all of these individuals had a hand in making sure I also got to tour campus, visit cultural and natural resources sites, and generally ensure that I received the best Nepali experience possible (which I think comes natural to them). I have to mention a special thanks to my friend, Chhan, who spent almost every waking hour with me and was largely responsible for how I experienced Nepal. You a competent statistician, an intellectual, and an exceptional host. To some degree, I approached this assignment expecting very little, and being totally prepared to “wing it” if need be. Everything I read about traveling to Nepal was that most non-Nepali visit to trek in the Himalayas, but it’s generally not the place you just up and decide to visit. Essentially, most people traveling here, plan, save an prepare for months. This was a little unnerving for me, but I think it added to my experience and alleviated many preconceptions or unreal expectations. We, as Americans, should be grateful that we have clean water and a dependable power supply. We should also be thankful we have food security, transportation safety regulations, and a well-developed sanitation system. I’ve said this before – that a good driver is worth their weight in gold – but the exchange rate has gone up after my trip to Nepal and especially during my time in Kathmandu. A good driver is worth 6x their weight in gold. 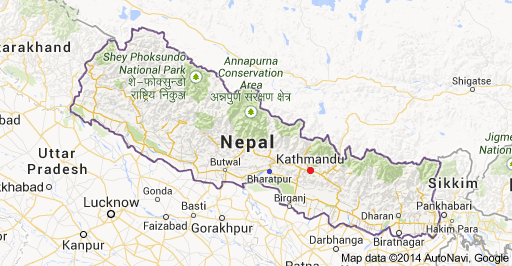 Kathmandu, and some of the larger cities like Bharatpur are extremely polluted. It doesn’t take away from its beauty, they’re just polluted. People here at home have been asking what it was like to see the Himalayas, and I have to explain that due to the smog, I never saw them. Not once. It’s sad, but the Nepali people’s sewage and waste infrastructure has failed to keep up with their urban expansion, leaving them with a serious problem. Crossing a Bagmati river in Kathmandu revealed piles of floating garbage (not a new issue) and the lack of pollution or emission standards is readily apparent as mini- and micro-buses, bikes, and all forms of vehicles constantly pump black fumes into the atmosphere. It’s impossible to talk about the effects of disturbances in mixed-conifer systems when the other party’s talking the importance of increased crop yields to feed the hungry or integrated pest management to reduce the impact of pesticides on human health (think DDT concerns in the US, circa 1940s only with humans). Some of the professionals I spoke with expressed interests in deforestation and land degradation, largely anthropogenic in nature, so I was able to see how my work might apply there… but it was a stretch. I also saw and read about numerous wildfires that were burning in community forests and near-by National Parks, but few seemed to think it was an “interesting” issue. I loved “having tea” and now see how it facilitates conversation and idea sharing. I wasn’t prepared for the fact that “having tea” doesn’t mean you’ll actually be drinking tea. It could be eating dal, having cookies and coffee, or any variety of thing. Essentially, it’s a break and an excuse to chat. Apparently, everyone outside of Kathmandu has a water buffalo or two. I don’t think they “own” them. The widespread use the internet and availability of information at a moment’s notice has changed our lives forever. Not everyone has this luxury. They might have smart phones and access to the internet, but I don’t think everyone uses it to empower and educate themselves quite like the I (we?) do. I hope I’m wrong on this one… My time in Nepal assured me that the people there have the intellectual capacity, but the resource limitations limit how they might achieve success. Facebook really has made the world smaller. I think my friend list doubled after this trip and I’ve corresponded with several participants over pictures, data, analysis, and all sorts of things. In a country where more than 70 percent of the population depends on agriculture for its livelihood, Nepal has done a superb job of recognizing the importance of community management and conservation of its forests. Bravo! Nepal’s flag is the only national flag in the world that is not rectangular in shape and is considered to be the most mathematical flag. Hell yeah! Go Math! The Nepali love football, but they LOVE cricket! 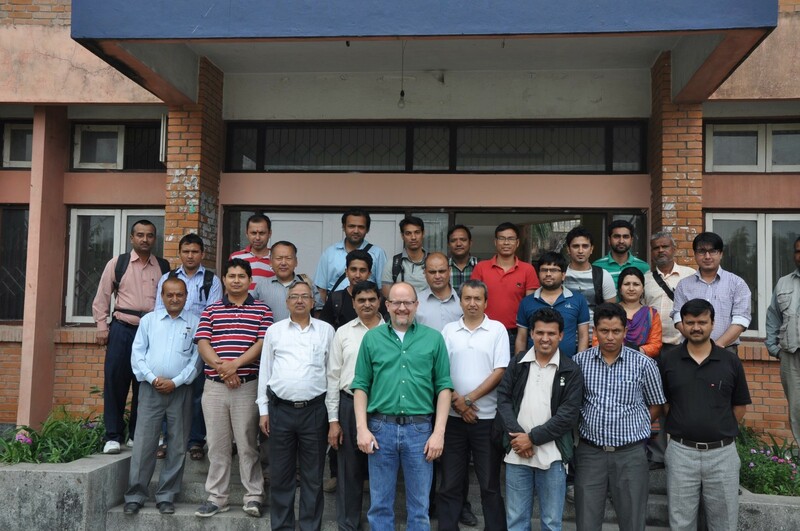 Myself and the participants in the 2014 workshop in Bharatpur, Chitwan, Nepal – Provided by Winrock Intl. and USAID. This morning we met with the USAID staff here in Kathmandu, Nepal and debriefed them on my assignment, signaling the end of my work here. Though I only spent six full days with the host institution at AFU, this experience has been a great opportunity. I truly feel that I’ve helped a developing country (a little) to increase their capacity to do agricultural and natural resource research, albeit indirectly through introducing them to R.
On a personal note, this was my first trip to Nepal, let alone south Asia and it’s been hugely eye opening. I now clearly see the need for further technology transfer and assistance, so that developing countries can benefit from global advancements and increase their own capacity. Activities such as those I’ve been engaged in here in Nepal are key to empowering local people to solving their specific problems. I firmly believe that the countries of the developed world cannot solve the problems in the developing world by giving physical of fiscal goods to them, but we can lessen the learning curve and empower individuals by providing help understanding technology emerging practices and removing barriers. We need to promote the sharing of technology and information so that people and communities in developing worlds are aware of the resources that are available to them and thus may become self-empowered. Next stop, Bangkok and then a short hop back to the States! In my previous post, I said I was headed to Nepal for a couple of weeks for an USAID assignment for the John Ogonowski and Doug Bereuter Farmer-to-Farmer Program, coordinated though Winrock International. My trip here was largely uneventful, and I am now writing this from my hotel room in the Royal Century Hotel in Bharatpur, Nepal (the blue dot above). So far, I’ve traveled quite a but (US to Kathmandu (the red dot), then to Bharatpur), ridden elephants on a jungle safari in Chitwan National Park, eaten lots of authentic Nepalese food, partaken of many beers (Everest, Tuborg and Carlberg), seen numerous research facilities around the Rampur Campus of AFU, and had many great conversation about the culture, ecology, political and socioeconomic issues facing Nepal. I didn’t really realize how far the country has come in the past decade. Tomorrow morning, I leave for Nepal for an USAID assignment for the John Ogonowski and Doug Bereuter Farmer-to-Farmer Program, coordinated though Winrock International. The assignment is with the Agriculture and Forestry University (AFU) in Rampur, Chitwan (Baratpur Campus, actually) which was founded in 2010. The details are not all that interesting, but AFU requested USAID (via subcontractor, Winrock) provide statistical expertise to conduct a comprehensive workshop introducing and applying an “easy to run and simple statistical system” that could help “researchers to summarize and analyze information with a computer.” I was told that AFU students and faculty were currently using SAS and Genstat (a UK-based, commercial package) but lacked expertise to teach one another. 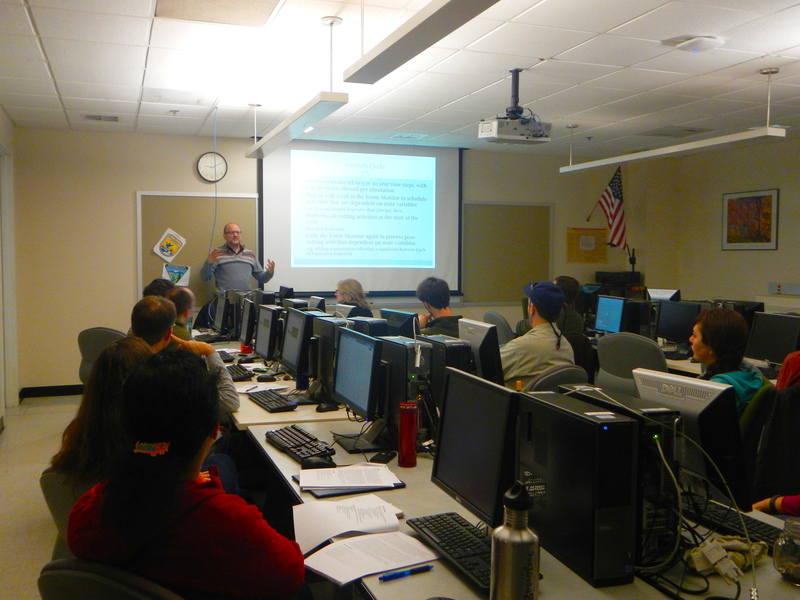 It may go without saying, but structuring the workshop around R was an easy sale and the rest is history.